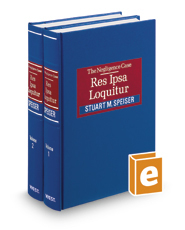 This set details exactly when, how, and under which circumstances the res ipsa doctrine can be used with maximum effectiveness. Contains discussions of general principles that govern the use of circumstantial evidence to prove negligence, basic prerequisites to use of res ipsa, and the precise standing of the doctrine in every American jurisdiction. Other areas of coverage include the essential elements of the res ipsa doctrine, limitations of the doctrine and trial techniques, as well as detailed explanation of specific applications, such as amusements, exhibitions, animals, aviation, and more.